Satan is a character that appears in the belief systems of many religions, including Christianity and Islam. In Judaism "satan" is not a sentient being but a metaphor for the evil inclination – the yetzer hara – that exists in every person and tempts us to do wrong. The Hebrew word "satan" (שָּׂטָן) translates to "adversary" and comes from a Hebrew verb meaning "to oppose" or "to obstruct." In Jewish thought, one of the things Jews struggle against every day is the "evil inclination," also known as the yetzer hara (יֵצֶר הַרַע, from Genesis 6:5). The yetzer hara is not a force or a being, but rather refers to mankind's innate capacity for doing evil in the world. However, using the term satan to describe this impulse is not very common. On the other hand, the "good inclination" is called the yetzer ha'tov (יצר הטוב). References to "satan" can be found in some Orthodox and Conservative prayer books, but they are viewed as symbolic descriptions of one aspect of mankind's nature. Satan appears as a proper being only twice in the whole of the Hebrew Bible, in the Book of Job and in the book of Zechariah (3:1–2). In both of these instances, the term that appears is ha'satan, with ha being the definite article "the." This is meant to show that the terminology is referring to a being. However, this being differs greatly from the character found in Christian or Islamic thought known as Satan or the Devil. In the book of Job, Satan is depicted as an adversary who mocks the piety of a righteous man named Job (אִיּוֹב, he's called Iyov in Hebrew). He tells God that the only reason Job is so religious is because God has given him a life filled with blessings. "But lay Your hand upon all that he has, and he will curse You to Your face" (Job 1:11). God accepts Satan’s wager and allows Satan to rain all manner of misfortune upon Job: his sons and daughters die, he loses his fortune, he is afflicted with painful boils. Yet even though people tell Job to curse God, he refuses. Throughout the book, Job demands that God tell him why all of these horrible things are happening to him, but God does not answer until chapters 38 and 39. "Where were you when I established the world?" God asks Job, "Tell me, if you know so much" (Job 38:3-4). Job is humbled and admits that he has spoken of things he does not understand. The book of Job grapples with the difficult question of why God allows evil in the world. It is the only book in the Hebrew Bible that mentions "satan" as a sentient being. The idea of satan as a being with dominion over a metaphysical realm never caught on in Judaism. 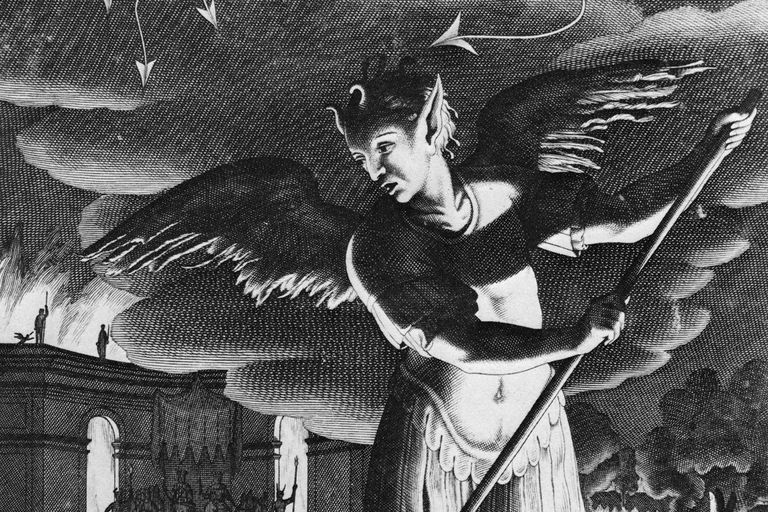 There are eight other references to satan in the Hebrew canon, including two that use the terminology as a verb and the rest that use the term to refer to an "adversary" or "hindrance." 1 Kings 5:18 = Solomon writes to Hiram reporting that there are no "adversaries"
1 Kings 11:14 = "And the Lord raised up an 'adversary' against Solomon, Hadad, the Edomite; he was of the royal lineage in Edom." 1 Kings 11:23 = "And God raised up against (David) an 'adversary,' Rezon, the son of Eliada, who had fled from Hadadezer, the king of Zobah, his master." 1 Kings 11:25 = "And (Rezon) was an 'adversary' to Israel all of Solomon's days with the evil that was caused by Hadad, and he detested Israel and ruled over Aram." Psalm 109:6 = "Set a wicked man over him, and let an 'adversary' stand at his right hand." In conclusion, Judaism is so strictly monotheistic that the rabbis resisted the temptation to characterize anyone other than God with authority. Rather, God is the creator of both good and evil, and it is up to mankind to choose which path to follow. Who Was Jesus According to Jewish Beliefs?